264 pages | 8 B/W Illus. This book explores the concept of ‘critical’ public health, at a point when many of its core concerns appear to have moved to the mainstream of health policy. Issues such as addressing health inequalities and their socioeconomic determinants, and the inclusion of public voices in policy-making, are now emerging as key policy aims for health systems across Europe and North America. the ethics of evaluation methods and the persistence of health inequalities. 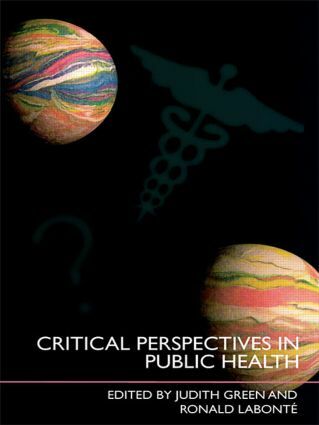 Critical Perspectives in Public Health is organized into sections covering four key themes in public health: social inequalities; evidence for practice; globalization; technologies and the environment. With contributions from a range of countries including the United States, Canada, the UK, Australia and South Africa, it provides an accessible overview for students, practitioners and researchers in public health, health promotion, health policy and related fields. Ronald Labonte is a Canada Research Chair in Globalization and Health Equity at the Institute of Population Health and Professor in the Department of Epidemiology and Community Medicine, University of Ottawa, Canada. Judith Green is Senior Lecturer in Sociology in the Department of Public Health and Policy, London School of Hygiene & Tropical Medicine, UK.